When “Into the Dalek” ended I felt rather sad. That’s not because it was over; I mean it was fine, but I’ll talk at you about that in a moment; no, it’s a sense I had – an old feeling. It was, I dare say, similar to the repressed memory of Rusty the Dalek, brought on by an in-built flaw, in this case not a radiation leak but the episode’s design, and not a vision of beauty like Rusty’s, but dread long buried, a state of mind that I call the Brannon Braga Effect. Brannon Braga was, as you should know from the “‘Condensed History of TV Sci-Fi” tape you were obliged to watch when you became showrunner, a long standing contributor to Star Trek: The Next Generation, Voyager and Enterprise. Fans slowly began to despise him, for a Braga script jettisoned human drama and meaty storytelling in favour of conceptual madness. He was a technocentric storyteller with the keys to the kingdom. As Trek entered a downturn, Braga became all-powerful. When Enterprise debuted, he was the big space cheese and many attributed that show’s creative stagnation, recycled plots, and general aimlessness, to burn out. Braga had simply been around too long. He was tired, Steven, and the depreciating vitality of his scripts and reliance on deranged concepts, symbolised the malaise. By the time new blood was pumped in, in the form of nu-boss Manny Coto, it was too late. The viewers had turned their phasers upon themselves. They never saw Coto’s excellent stories. What shocks me is that I’m feeling Bragaed just two episodes into this new run. 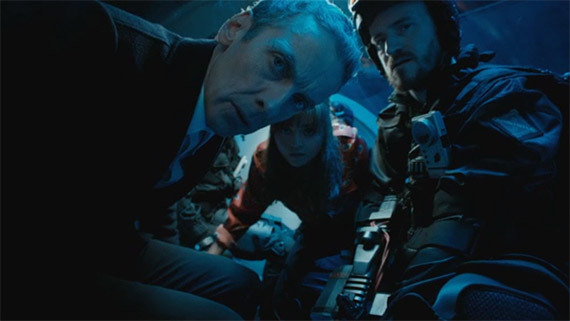 I like Capaldi’s Doctor, I like the dynamic between him and Clara, but I felt distanced from this story, as though mentally ticking off familiar elements. I think the comic writer in you thought that a Dalek riff on Fantastic Voyage was morbidly funny, and I suppose I agree, but I’d have preferred a story laced with intrigue and substance, rather than a minitaurised tour of a robot Nazi. Of course all of this was just a device, literalised and writ large, for exploring the episode’s big theme, and we now realise, the hook on which you’ve hung the series. Is the Doctor a good man these days? At first the question seems facile, absurd even. Who, no pun intended, could doubt it after fifty years and a million seasons? But I suppose you’ve piggy backed doubt on to this latest iteration of the character, using the regeneration to introduce an element of distrust. I’m afraid you’re going to have to work hard to convince me that our man’s got a tarnished soul, and I can’t understand for the life of me why Clara would have her doubts, having enjoyed the Doctor’s warmth and protection for some time now, but this is the age of uncertainty, I get it, the era of the psychologically dense Doctor, so we must play along, even if we don’t believe it. I suppose in a bid to revitalise the character and introduce an element of mystery, this is your version of the Cartmel Masterplan, the truncated scheme of yesteryear, in which Andrew Cartmel developed a backstory that would add hidden layers to a man we’d never thought to scrutinise. However, I’d argue his idea was rather better than yours, rooted as it was in biographical detail, rather than philosophical musings and self-doubt. Last week you introduced a moment of ambiguity; the possibility that the new Doctor is a murderer; this week you pushed us toward that conclusion, showing a certain callousness when he sacrificed a mono-dimensional background character to save the group and himself, and a sociopathic streak when, confronted with the man’s remnants in a soup of protein, he deadpanned, “he’s the top layer, if you want to say a few words”. It was a good line, Steven, but I rather thought you gave the game away when lifeless story element Gretchen was sent to her death and ended up in the mysterious Missy’s afterlife apparent. The message seemed to be that this woman, whoever she is, is hoarding those the Doctor’s sent to their deaths; a group we’ll soon be calling Team Grievance. I wondered if “heaven”, which I’m beginning to suspect is a TARDIS (as you’d need a scooping mechanism that could be in any place and time, as required), was a means to have it both ways. Are we to infer the Doctor, while searching for his moral dimension, will kill a character a week, only to redeem himself in the finale by saving them all from Missy’s clutches? Or will we discover that Missy has orchestrated each situation, essentially forcing the Doctor’s hand? If that’s the plan, Steven, doesn’t this season’s grand design just amount to another big tease? Where’s the meat? If you want to deepen the Doctor’s character you will, at some stage, have to show him making irreversible mistakes. That said, he could have a hundred incarnations and it’s likely he’ll never top the War Doctor’s genocide. The weakness of Into the Dalek was that it was no more than its hook. Sure, we got to think about whether the Daleks were redeemable, and by extension, whether the Doctor was experiencing the converse malfunction, a certain relaxed attitude toward killing, underlined by the Dalek appropriating his Skaro-racism and using it to butcher fellow pepperpots, but what was lacking was a catalyst for the Doctor’s transformation. Regeneration is convenient but it’s not enough. If you’re serious about moving the Doctor toward the Valeyard, whom you may wish to re-introduce by the way, and who might have been a better big bad for this season than a woman modeled on the world’s worst online pick up, then we’ll need the very thing you may not have it in you to give us: character changing moments wrapped in story complications. Drama, Steven. Drama. This is why you now have an air of Braga about you. You’re backing up emotional arcs with recycled concepts – reaching for the Daleks because they’re an easy opposite for the Doctor to play off. I want character moments Steven, but I want them arising from the collision of Doctor and story, not Doctor and concept. Only then will this new man’s adventures feel fresh. P.S: Hardly an episode goes by these days without a bit of sexual politics. Last week, a lesbian kiss. This week, gender roles. Boorish new man and former solider Danny is Pink, feminoid female solider Journey, blue. Keep it up, Steven – you’ll have society recalibrated in no time. P.P.P.S: Next week, Robin Hood? For the last time, Steven – you don’t have enough episodes in each series to indulge in the equivalent of Star Trek’s holodeck stories. He better be a thieving android.